For other uses, see Sine (disambiguation). Not to be confused with sign, sign (mathematics), or sin. 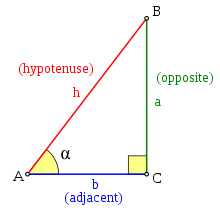 For the angle α, the sine function gives the ratio of the length of the opposite side to the length of the hypotenuse. The opposite side is the side opposite to the angle of interest, in this case side a. The adjacent side is the remaining side, in this case side b. It forms a side of (is adjacent to) both the angle of interest (angle A) and the right angle. appears to depend on the choice of right triangle containing an angle of measure α. However, this is not the case: all such triangles are similar, and so the ratio is the same for each of them. Unit circle: the radius has length 1. The variable t measures the angle referred to as θ in the text. In trigonometry, a unit circle is the circle of radius one centered at the origin (0, 0) in the Cartesian coordinate system. Let a line through the origin, making an angle of θ with the positive half of the x-axis, intersect the unit circle. The x- and y-coordinates of this point of intersection are equal to cos(θ) and sin(θ), respectively. The point's distance from the origin is always 1. Unlike the definitions with the right triangle or slope, the angle can be extended to the full set of real arguments by using the unit circle. This can also be achieved by requiring certain symmetries and that sine be a periodic function. is graphed from the y-coordinate (red dot) of a point on the unit circle (in green) at an angle of θ. The usual principal values of the arcsin(x) function graphed on the cartesian plane. Arcsin is the inverse of sin. The inverse function of sine is arcsine (arcsin or asin) or inverse sine (sin-1). As sine is non-injective, it is not an exact inverse function but a partial inverse function. For example, sin(0) = 0, but also sin(π) = 0, sin(2π) = 0 etc. It follows that the arcsine function is multivalued: arcsin(0) = 0, but also arcsin(0) = π, arcsin(0) = 2π, etc. When only one value is desired, the function may be restricted to its principal branch. With this restriction, for each x in the domain the expression arcsin(x) will evaluate only to a single value, called its principal value. C denotes the constant of integration. for all angles x. Also, the derivative of the function sin(x) is cos(x). It is possible to express any trigonometric function in terms of any other (up to a plus or minus sign, or using the sign function). Note that for all equations which use plus/minus (±), the result is positive for angles in the first quadrant. The quadrants of the unit circle and of sin(x), using the Cartesian coordinate system. The following table gives basic information at the boundary of the quadrants. This animation shows how including more and more terms in the partial sum of its Taylor series approaches a sine curve. Using only geometry and properties of limits, it can be shown that the derivative of sine is cosine, and that the derivative of cosine is the negative of sine. The coefficients for both the sine and cosine series may therefore be derived by substituting their expansions into the pythagorean and double angle identities, taking the leading coefficient for the sine to be 1, and matching the remaining coefficients. In general, mathematically important relationships between the sine and cosine functions and the exponential function (see, for example, Euler's formula) are substantially simplified when angles are expressed in radians, rather than in degrees, grads or other units. Therefore, in most branches of mathematics beyond practical geometry, angles are generally assumed to be expressed in radians. A similar series is Gregory's series for arctan, which is obtained by omitting the factorials in the denominator. The continued fraction representation can be derived from Euler's continued fraction formula and expresses the real number values, both rational and irrational, of the sine function. The fixed point iteration xn+1 = sin(xn) with initial value x0 = 2 converges to 0. Zero is the only real fixed point of the sine function; in other words the only intersection of the sine function and the identity function is sin(0) = 0.
. This integral is an elliptic integral of the second kind. Some common angles (θ) shown on the unit circle. The angles are given in degrees and radians, together with the corresponding intersection point on the unit circle, (cos(θ), sin(θ)). For certain integral numbers x of degrees, the value of sin(x) is particularly simple. A table of some of these values is given below. An illustration of the complex plane. The imaginary numbers are on the vertical coordinate axis. r and φ represent the magnitude and angle of the complex number respectively. i is the imaginary unit. z is a complex number. Although dealing with complex numbers, sine's parameter in this usage is still a real number. Sine can also take a complex number as an argument. Domain coloring of sin(z) in the complex plane. Brightness indicates absolute magnitude, saturation represents complex argument. It is also related with level curves of pendulum. The function sine (and cosine) can be traced to the jyā and koṭi-jyā functions used in Gupta period (320 to 550 CE) Indian astronomy (Aryabhatiya, Surya Siddhanta), via translation from Sanskrit to Arabic and then from Arabic to Latin. The first published use of the abbreviations 'sin', 'cos', and 'tan' is by the 16th century French mathematician Albert Girard; these were further promulgated by Euler (see below). The Opus palatinum de triangulis of Georg Joachim Rheticus, a student of Copernicus, was probably the first in Europe to define trigonometric functions directly in terms of right triangles instead of circles, with tables for all six trigonometric functions; this work was finished by Rheticus' student Valentin Otho in 1596. In a paper published in 1682, Leibniz proved that sin x is not an algebraic function of x. Roger Cotes computed the derivative of sine in his Harmonia Mensurarum (1722). Leonhard Euler's Introductio in analysin infinitorum (1748) was mostly responsible for establishing the analytic treatment of trigonometric functions in Europe, also defining them as infinite series and presenting "Euler's formula", as well as the near-modern abbreviations sin., cos., tang., cot., sec., and cosec. Look up sine in Wiktionary, the free dictionary. Etymologically, the word sine derives from the Sanskrit word for chord, jiva*(jya being its more popular synonym). This was transliterated in Arabic as jiba جيب, which however is meaningless in that language and abbreviated jb جب . Since Arabic is written without short vowels, "jb" was interpreted as the word jaib جيب, which means "bosom". When the Arabic texts were translated in the 12th century into Latin by Gerard of Cremona, he used the Latin equivalent for "bosom", sinus (which means "bosom" or "bay" or "fold"). Gerard was probably not the first scholar to use this translation; Robert of Chester appears to have preceded him and there is evidence of even earlier usage. The English form sine was introduced in the 1590s. The sine function, along with other trigonometric functions, is widely available across programming languages and platforms. In computing, it is typically abbreviated to sin. Some CPU architectures have a built-in instruction for sine, including the Intel x87 FPUs since the 80387. In programming languages, sin is typically either a built-in function or found within the language's standard math library. For example, the C standard library defines sine functions within math.h: sin(double), sinf(float), and sinl(long double). The parameter of each is a floating point value, specifying the angle in radians. Each function returns the same data type as it accepts. Many other trigonometric functions are also defined in math.h, such as for cosine, arc sine, and hyperbolic sine (sinh). Similarly, Python defines math.sin(x) within the built-in math module. Complex sine functions are also available within the cmath module, e.g. cmath.sin(z). CPython's math functions call the C math library, and use a double-precision floating-point format. There is no standard algorithm for calculating sine. IEEE 754-2008, the most widely used standard for floating-point computation, does not address calculating trigonometric functions such as sine. Algorithms for calculating sine may be balanced for such constraints as speed, accuracy, portability, or range of input values accepted. This can lead to different results for different algorithms, especially for special circumstances such as very large inputs, e.g. sin(1022). A once common programming optimization, used especially in 3D graphics, was to pre-calculate a table of sine values, for example one value per degree. This allowed results to be looked up from a table rather than being calculated in real time. With modern CPU architectures this method may offer no advantage. The CORDIC algorithm is commonly used in scientific calculators. The accuracy advantage stems from the ability to perfectly represent key angles like full-Turn, half-Turn, and quarter-Turn losslessly in binary floating-point or fixed-point. In contrast, representing 2*pi, pi, and pi/2 in binary floating-point or binary scaled fixed-point always involves a loss of accuracy. Turns also have an accuracy advantage and efficiency advantage for computing modulo to one period. Computing modulo 1 Turn or modulo 2 half-Turns can be losslessly and efficiently computed in both floating-point and fixed-point. For example, computing modulo 1 or modulo 2 for a binary point scaled fixed-point value requires only a bit shift or bitwise AND operation. In contrast, computing modulo 2*pi involves inaccuracies in representing 2*pi. For applications involving angle sensors, the sensor typically provides angle measurements in a form directly compatible with Turns or half-Turns For example, an angle sensor may count from 0 to 4096 over one complete revolution. If half-Turns are used as the unit for angle, then the value provided by the sensor directly and losslessly maps to a fixed-point data type with 11 bits to the right of the binary point. In contrast, if Radians are used as the unit for storing the angle, then the inaccuracies and cost of multiplying the raw sensor integer by an approximation to pi/2048 would be incurred. ^ a b Uta C. Merzbach, Carl B. Boyer (2011), A History of Mathematics, Hoboken, N.J.: John Wiley & Sons, 3rd ed., p. 189. ^ Nicolás Bourbaki (1994). Elements of the History of Mathematics. Springer. ^ See Merzbach, Boyer (2011). ^ Eli Maor (1998), Trigonometric Delights, Princeton: Princeton University Press, p. 35-36.